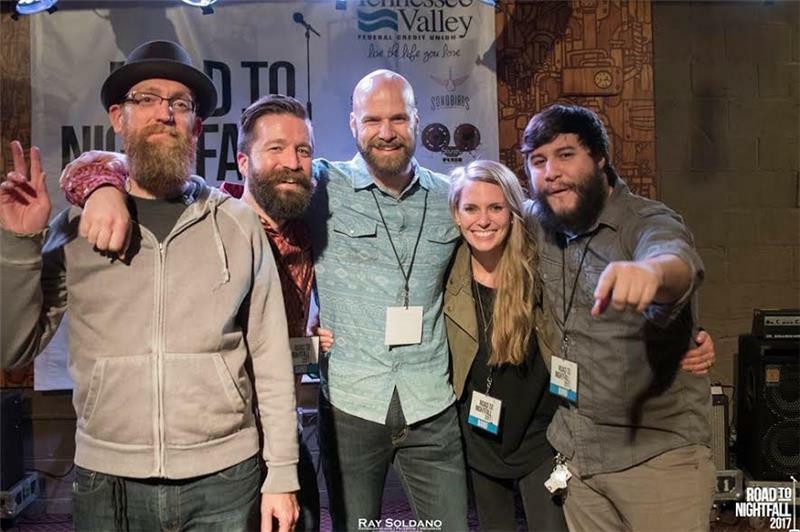 The Nightfall Concert Series, produced by Chattanooga Presents, continues its 30th season this Friday at Miller Plaza with a headline performance by local band Monday Night Social, with Drakeford to open. Based out of Cleveland, Monday Night Social took home the coveted win for the 2017 Road to Nightfall contest, giving them the opportunity to perform a 90-minute headlining set at the Nightfall concert series. This upcoming band is known for their melodic blend of influences ranging from folk to blues with hints of bluegrass and pop. Monday Night Social is a band poised to make their mark with personal songwriting and eclectic style. Their unique and resonant sound compliments thoughtful lyrics and catchy melodies. The husband and wife songwriting duo, Drakeford, will open the show with a set beginning at 7:00pm. After auditioning and reaching the second round of American Idol in 2009, Drake decided he wanted to take his passion for music overseas and use it to share about his faith. His wife Lucy Jayne hails from the West Midlands of England, but has also done a considerable amount of hopping around in her life, including a move to the U.S. with her family at the age of 10. The two met in Turkey, and moved back to the U.S. in 2014. Held each Friday at Miller Plaza through Aug. 25 (with the exception of June 9 and 16 during Riverbend), Nightfall showcases a broad spectrum of musical genres featuring a local band at 7 p.m., followed by a headline show by a national artist at 8 p.m., many of whom are performing for the first time in our city. These shows are free to the public and appropriate for a family audience. Nightfall bulk discount beer and wine tickets are again be available this year at each show, offering a 20 percent savings on a packet of 20 beer and wine tickets. Food trucks and non-alcoholic drink concessions are also available on site. No outside food or beverages are allowed to be brought in to Nightfall, therefore coolers are not allowed. Since 1988 Nightfall has grown into Chattanooga’s signature summertime program for Chattanooga and the surrounding region. Known for its family-friendly environment as well as being recognized nationally for the quality of its musical programming and locally as “Best of the Best” for Chattanooga Events, Nightfall is a family-friendly concert series with an average attendance of between 2,500-3,000 each night. For more information on this free community concert series, call 265-0771 or visit NightfallChattanooga.com for a complete, interactive website that includes music samples by each headliner, as well as other important information for first-time attendees.